Conceição beach was the most accessible in 2012. 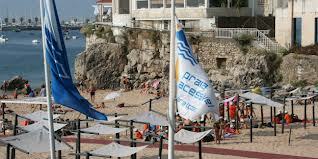 The ConceiçãoBeach in Cascais, was awarded as the ” + Accessible Beach” in 2012, at the Conference on “Tourism and Accessibility” BTL 2013, which was held in Lisbon between February 27th and March 3rd . The Prize” Praia + Acessível” (+Accessible Beach” highlights the beach that best evidenced by improving accessibility for people with reduced mobility. This award is part of the “Most Affordable Beach, Beach For All” organized by National Institute of Rehabilitation. Second place went to Miramar Beach, in Vila Nova de Gaia. The Valhelhas river beach, Guarda county received an Honorable Mention. The delivery of this award took place in the latest edition of the Bolsa de Turismo de Lisboa (BTL 2013), held in FIL. “Praia Acessível, Praia para Todos” Lista de praias galardoadas em 2012- “Accessible Beach, Beach For All”. 2012 Awarded beaches list. Praias da Conceição, Tamariz e Carcavelos com Tiralô – Beaches of Conceição, Tamariz and Carcavelos with amphibious chair. ‹ PreviousPraia da Conceição foi a mais acessível em 2012. Next ›Associação Salvador lança aplicação Portugal Acessível Mobile.